The ODS SELECT statement restricts the output to the "ParameterEstimates" and "FitQuantiles" tables and the histogram; see the section ODS Table Names. The BETA primary option requests a fitted beta distribution. The THETA= secondary option specifies the lower threshold. The SCALE= secondary option specifies the range between the lower threshold and the upper threshold. Note that the default THETA= and SCALE= values are zero and one, respectively. The FILL secondary option specifies that the area under the curve is to be filled. The HREF= option draws a reference line at the lower bound, and the HREFLABEL= option adds the label Lower Bound. The ODSTITLE= option adds a title to the histogram. The INSET statement adds an inset with the sample size positioned in the northeast corner of the plot. 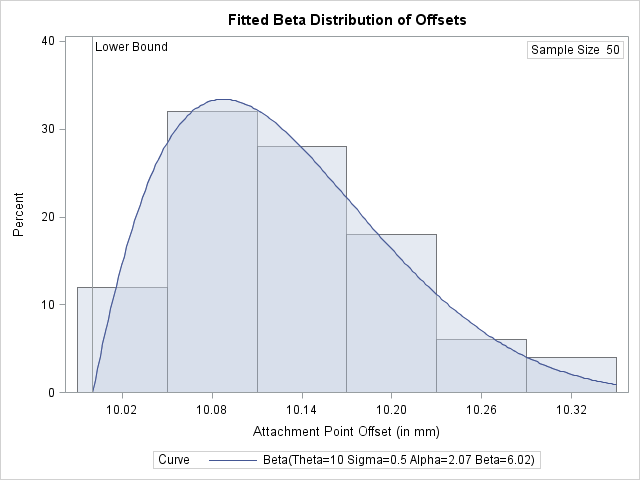 In addition to displaying the beta curve, the BETA option requests a summary of the curve fit. This summary, which includes parameters for the curve and the observed and estimated quantiles, is shown in Output 4.21.2. A sample program for this example, uniex12.sas, is available in the SAS Sample Library for Base SAS software.